Sometimes, you need some extra warmth, a bit more coverage, or just need to pull an outfit together. 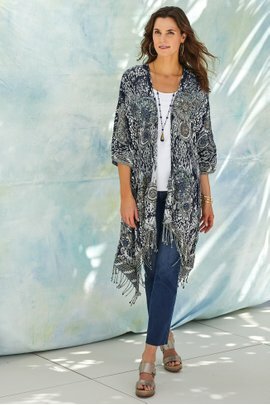 Our collection of women's toppers, ponchos, and dusters can help you effortlessly create a great look.Our women's ponchos are always in fashion, allowing you to stay warm while not restricting your movement. Ponchos look great over both skirts and slacks, and are versatile enough to be worn during the day as well as the evening.The collection of women's dusters at Soft Surroundings provides lightweight coverage that looks great as outerwear but can be worn indoors as well. The same is true of many of our toppers, which are available in a range of fabrics that make them suitable for wearing at home, over a sundress at your favorite resort, or as a lightweight alternative to a traditional wrap when you are out for the evening.This collection also incorporates rich fabrics and exclusive details, such as embroidery, intricately woven cloth, and beadwork. Of course, you'll also find that these garments are incredibly soft: Check out our softness ratings so that you can select the one that keeps you most comfortable.